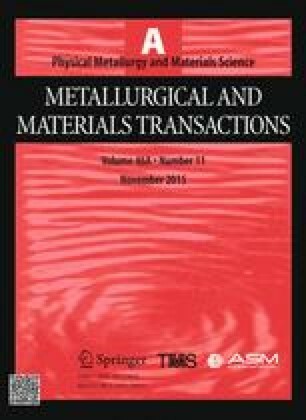 Intergranular strains due to tensile plastic deformation were investigated in a commercially pure Ti. Neutron diffraction has been used to characterize the evolution of residual elastic strain in grains with different crystallographic orientations. Experimental data have been obtained for the macroscopic stress–strain curve and the intergranular strain evolution in the longitudinal and transverse direction relative to the uniaxial loading axis. The elasto-plastic self-consistent (EPSC) approach was used to model the deformation behavior of the studied material. Comparison between the neutron measurements and the model predictions shows that in most cases the EPSC approach can predict the lattice strain evolution and capture the plastic anisotropy observed in the experiments. Manuscript submitted October 7, 2014. The authors thank the ISIS and ILL neutron facilities scientific committees for the allocated experimental days on the SALSA (experiment 1-02-30, ILL, France) and GEM (experiment RB1010055, ISIS, UK) instruments. 3.ISIS, STFC Rutherford Appleton Laboratory Chilton DidcotOxfordshireU.K.